With the approach of the 704th anniversary of the Battle of Bannockburn this weekend, it is worth re-visiting one of the Smith’s more famous paintings. 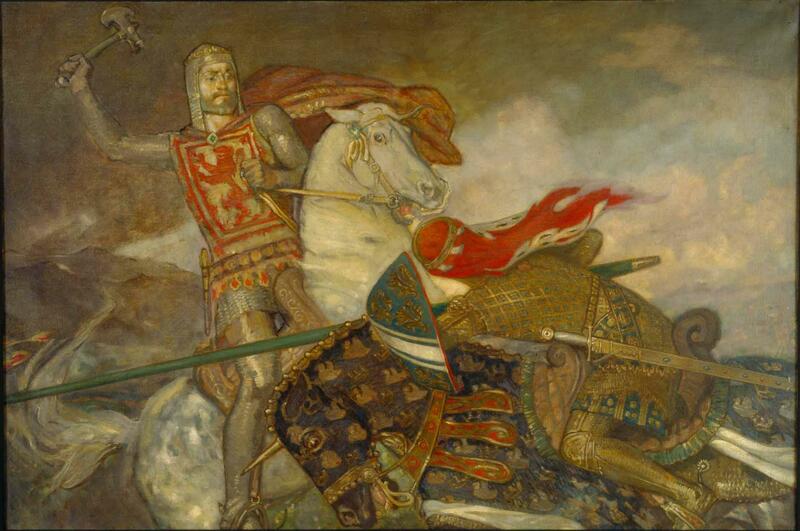 ‘Bruce and de Bohun’ was painted by artist John Duncan (1866 – 1945) as an entry in the national competition run by Kelvingrove Art Gallery for works to celebrate the 600th anniversary of the battle in 1914. The work of the prize-winning artist John Hassall which hangs in Kelvingrove today was highly unpopular and condemned as ‘the False Bannockburn’, the choice of scene being the prayers before the battle. Duncan chose an episode from 23 June. Artists have tackled this subject again and again, perhaps because it is so graphically described by the poet John Barbour (1320-95) in his epic poem, The Bruce. Immediately before the Battle, the English knight Sir Henry de Bohun challenged King Robert, thinking because he looked insignificant on his small grey horse, he could kill him. Bruce killed de Bohun with one stroke of his battle axe. The artist has depicted carefully the costume and heraldic tributes of the two warriors. John Duncan exhibited at the Smith and gave a talk on ‘Painting Today’ in 1938. Knowing how important Bannockburn is to the history of Stirling and Scotland, he bequeathed this work to the Smith.